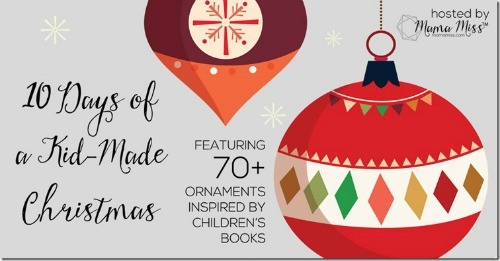 Christmas is a special time of year that is made even better with good books and crafts! 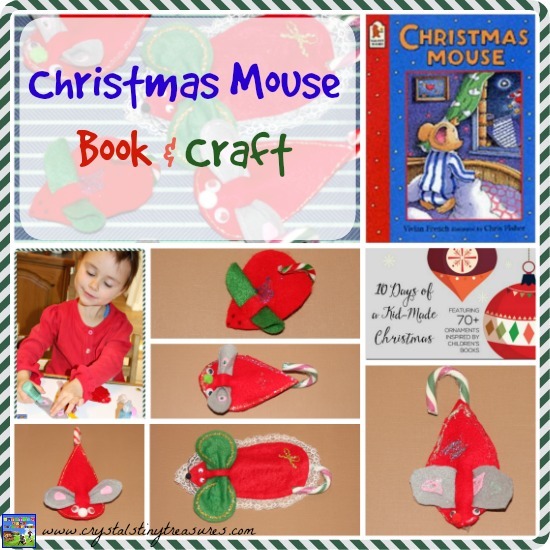 Today I’m delighted to be sharing Christmas Mouse and a mouse craft with you as part of 10 Days of a Kid-Made Christmas. 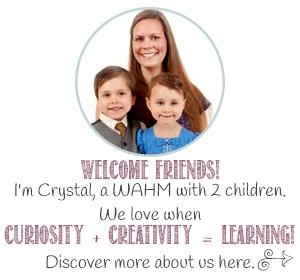 Over 70 KBN Bloggers are coming together with book-inspired crafts for you. 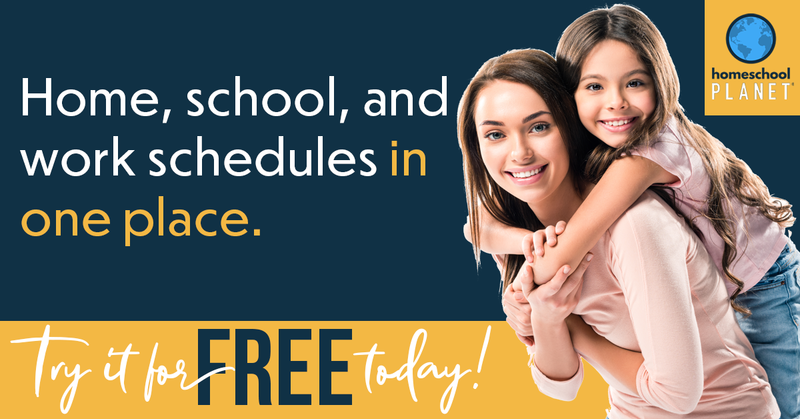 All the links can be found later in this post. The book we’ve chosen is Christmas Mouse by Vivian French and illustrated by Chris Fisher. Middling Mouse is feeling left out. He often feels forgotten about, being the middle mouse. He has a cold and can’t go out with his family to visit the next door neighbour for dinner. He can hear them through the wall and is lonely. Middling Mouse hears a huge sneeze outside! Upon investigation, he discovers Father Santa on his doorstep! Middling Mouse invites Father Christmas in and settles him in the most comfortable chair and makes him a hot lemon drink. Soon they both fall asleep. When Middling is awoken by his family, Father Christmas is gone and no one believes that he was there. Christmas morning arrives and they have a big surprise when they find the table overflowing with lemons and a special package and note has been left behind for Middling. Now they know Middling Mouse must be very special and his family now calls him by name, Alexander. I always adored the felt mice Mom had in our tree, and I treasure the none my nephew made for me when he was a pre-schooler. I’ve been waiting patiently to do this craft with my own children, and this is the year. Glitter glue, ribbon, lace, etc. 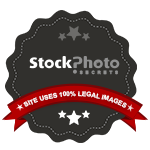 Create a template to use for your mouse. Candy canes vary so much in size that there isn’t a one-size-fits-all pattern. The body is similar to an oval with a pointy end. The ears are a rectangle with rounded ends. 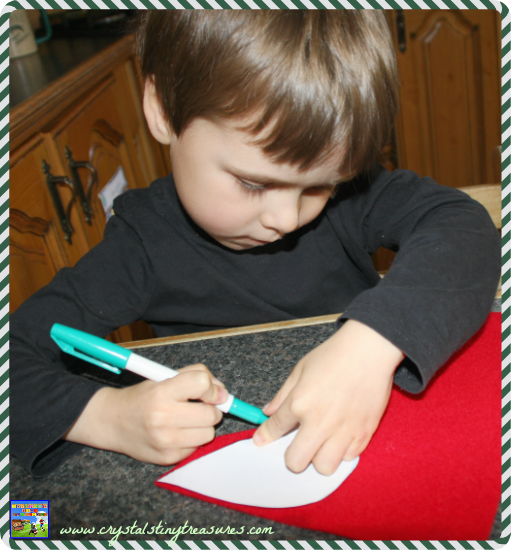 Once you’re happy with your template, use it to trace the shapes onto your felt. We had red and grey felt in our folder, so that’s what we used. Cut 2 little slits lengthwise about 1/4 to 1/3 of the from the blunt front of the body. Slide the ears in to make sure it’s a good fit. Now decorate your felt Christmas mouse in any style that you’d like. My children made some pink inner-ears, and they went to town with the glitter glue. My Mom was more elegant in her decorating by using some lace for trimming. Just like people, every mouse will be unique. 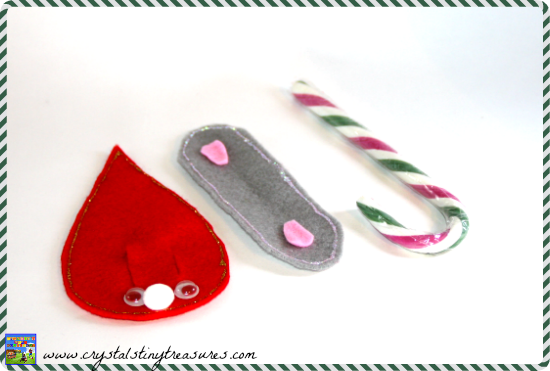 To finish your felt mouse, tuck the long end of your candy cane under the ears on the back of the mouse and let the curve of the candy cane act as the tail. Tuck your little felt mouse gently onto a branch of your Christmas tree and it’ll watch for Santa’s arrival, just like Middling Mouse. But be careful, these little mice like to multiply! 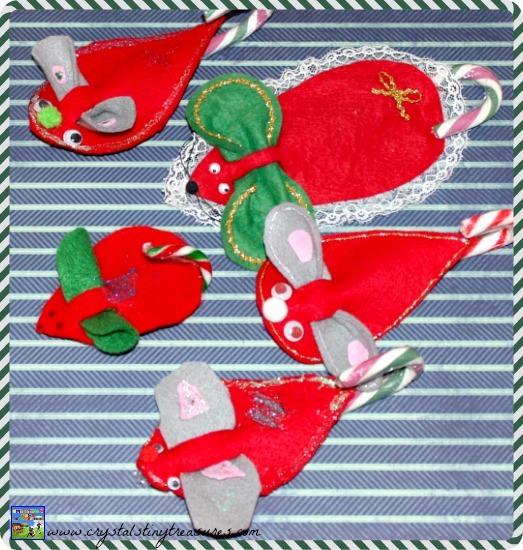 These little felt mice also make cute little additions to the top of wrapped gifts. For more kid-made Christmas crafts see this post or our Christmas ideas page. This is such a versatile ornament as there are so many Christmas books with mice! That’s very true! We’d actually started off with another book in mind, then changed our minds another 2 times as we thought this one was the most appropriate of the 3…but the others have ideas perculating for next year! Thanks for stopping by 😉 Merry Christmas! This book sounds adorable and the ornament mice certainly are! Thanks for sharing this at Booknificent Thursday!